There are some dishes I cook as I have grown up eating and watching my mother cook them, and a few others which I have eaten a few times, but learnt making them from my mother-in-law. My mother doesn't make them you see. My mother-in-law lived in Mysore for quite some time, my mother has her roots in Rayalseema (a part of Karnataka which is the border between Karnataka and Andhra). So they have different styles of cooking and their own specialties. Some dishes which my mother makes, mother-in-law doesn't and vice versa. Mother-in-law makes excellent kodubale, chakli, kobbari mithayi, menthya bele huli, kayi-sasuve chitranna etc. 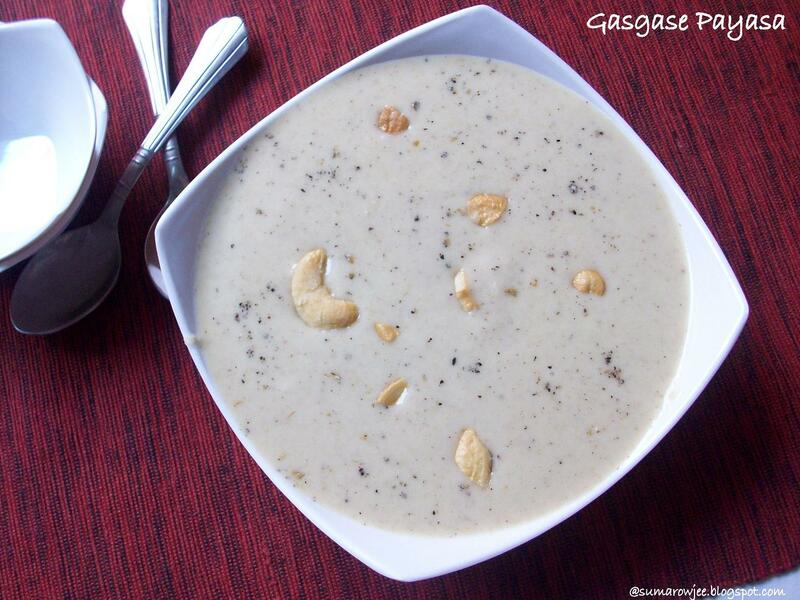 Gasagase payasa or poppy seeds pudding is another dessert she makes really well . Apart from other occasions, she makes this for Ganesha Chaturthi as a family tradition (I have no complaints eating dessert for breakfast, will make sure this tradition is carried forward dutifully!). The pooja in the morning is quite elaborate and by the time we eat breakfast, its around 12!! Breakfast comprising of soft idlis, coconut chutney and gasagase payasa will thankfully be ready by then and waiting, so nobody (read me) actually faints of starvation. The gourmet breakfast is substantial enough to keep us full till the late elaborate lunch of kadabu, chitranna, ambode, majjige huli etc ...burrp! The payasa itself was not very common to me, the combination even uncommon. Dunking some idlis in the chutney and some in the payasa - a nice combination if you have a sweet-tooth. This pudding (for the medicinal value of poppy seeds) is supposed to be a remedy for mouth ulcer (don't you love such delicious medicines!) Again, there are different ways of making this pudding. Commonly made by grinding soaked poppy seeds (sometimes roasted), dry fruit like almonds or cashew, rice and fresh coconut, simmered with jaggery and water. A splash of milk and the customary ground cardamom is added in the end . I prefer and like a predominant taste of jaggery and less milk and a slightly thicker consistency. You could add more of milk and less of water and also thin the consistency if you prefer. Procedure: Soak the poppy seeds, almonds and rice in enough water for at least 3-4 hours. ( I soak overnight in the fridge if I need to make this early in the day). Drain and the water (using a fine meshed sieve preferably, makes it easier with the tiny seeds) Pour more water through the sieve to rinse. Using as little water as possible, grind the poppy seeds, coconut, rice and almonds to a fine paste. The smallest jar of your mixer will be the best for this. In heavy bottomed pan, take the jaggery and 1/2 cup water, heat to dissolve it. (Strain the liquid if there are any impurities and return the jaggery water to the heat. Mix the ground paste with 1/2 cup water to thin it to the consistency of dosa batter. Add it to the water and jaggery. Mix well. Add 1 cup water (approximately) to get the desired consistency. Go easy with the water (or milk), you can always add more later to thin it. Cook on low heat till it thickens slightly, about 5 minutes. Turn off the heat. Add about 2-3 tablespoons of milk if desired. 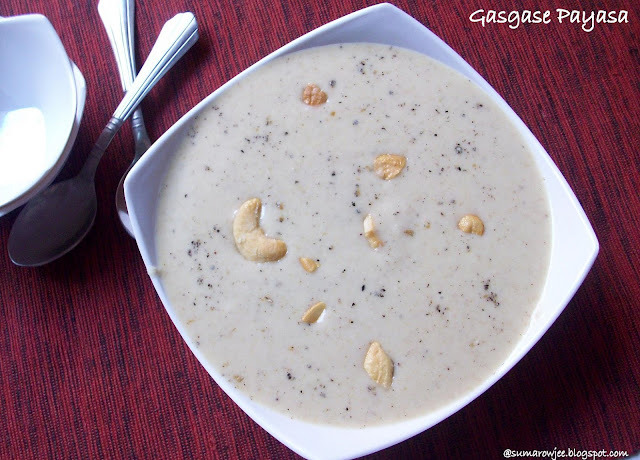 Mix in the crushed cardamom and the fried cashew nuts. Serve warm or at room temperature. Please note: Alter the amount of jaggery (this also depends on the variety) and milk / water to suit your taste. When you add the jaggery, do remember that the pudding will taste sweeter and will also thicken slightly once it cools. The color of the pudding depends on the color of the jaggery and the amount of milk used. The pudding in the above pictures has a little more milk than I prefer adding, hence the lighter color. You could use milk from a tetra-pack instead of the coconut, but the coconut really helps grinding the poppy seeds to a smooth paste, so I prefer using fresh coconut. The above proportions will make enough to serve 4-5 people. Yum yum! I can hear some happy burps! Just love this payasa... the thought of it floods me with array of memories, all associated with festivals, childhood, celebrations, guests at home. God! I am living life again with this post of urs! ok so gasgase is poppy seeds. its almost 5 years that I wanted to know what this particular spice actually is and finally got to know from you. 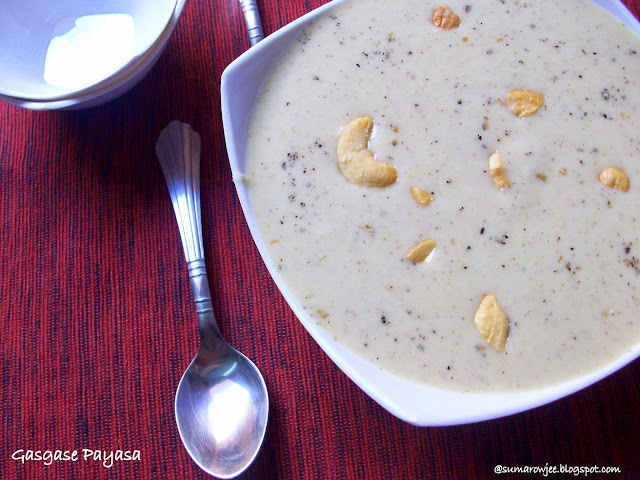 poppy seeds is very common in our Bengali kitchen but this dessert is something I never tasted. looks delicious and creamy. 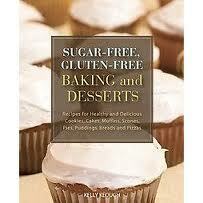 I recently purchased a book for baking and in all the bread baking receipes...it has strong white bread flour. I searched all over blore,but not able to get. Any idea where i can get this in blore. Its been a long time since I made this. Thanks. yummmm, am in payasa heaven now. Have to try this out,your recipe comes in at a convenient time for me- April is the month of several Birthdays at home and I need a new payasa for each one! Did try it out for Ugadi. Was very nice. Is there a minimum time to boil the paste with the milk so the 'raw' flavour gives in to a creamy goodness? I simmered the paste+milk for 15 minutes with stirring, felt I could have done it for longer.